Anyhoo, there were some issues during the headstart but all in all I didn't think it was that bad. I don't know it makes me extremely lucky or goes to show how pessimistic and cynical I became. I was expecting a lot more in terms of crashes, disconnections, lag and not being able to make a character in the server of my choice due to it being full. Although I did have a few disconnections here and there, it wasn't nearly as bad as I was fearing. The lag I only suffered with a bit on Sunday morning. But then again I did spend most of my gameplay time so far in overflow servers. So at least in terms of lag, the overflow servers seem to be working beautifully. 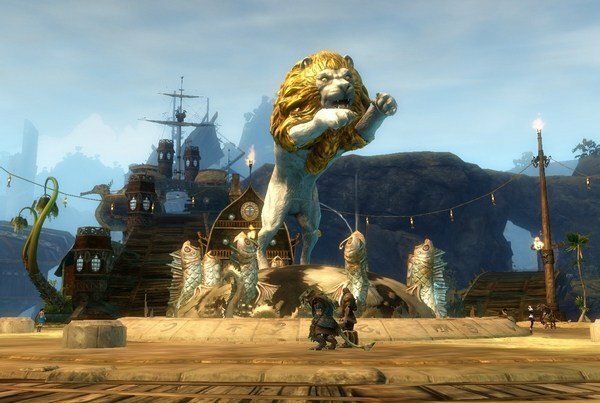 As for the more bigger issues (guild problems, people having trouble grouping because of the overflow servers, trading post being down) I am pretty confident ArenaNet will solve all the problems in a very short time. In fact, let me give kudos to all the staff at ArenaNet for all the work you have been putting since the headstart launch and for keeping people updated on the current game issues. My experience on the Tarnished Coast server has been very interesting so far as well. I often forget that it is an unofficial roleplaying server and find myself surprised when people roleplay in the open. Or perhaps, surprised shouldn't be so much the word as unused to it even though I did play on the Antonia Bayle server, the official roleplaying server for Everquest 2, for a few years. Oh, if anyone is on that server and see a charr named Kahlef or an asura named Rakuno feel free to /wave a hello. Or if you want to add me to your friend list for any reason, just add Kahlef.7954. "The game certainly isn’t perfect – absolutely no game is. But as I said on twitter, it IS perfect for me." Reblogged this on Gigable - Tech Blog.